As you might have heard on the Metaversed Podcast there is something going on in the Second Life advertising space. It’s called behavioral targeting and is all about presenting you the right ads in the right context. It basically means that information of you is collected, such as where you have been last, where you have been shopping and so on. This information is then used to present you the right advertisment when you are next to a billboard. If the system is clever it can even predict what you might need next (like if you last bought a house you might need furniture). Now the Berlin based Second Life ad agency “Inworld Advertising Network” (IAN) (english summary here) run by my friend Sebastian Küpers (Sebastian Otareed in SL) in Second Life now in collaboration with nugg.ad created such a solution. There is a demo installation setup on FutureAd-Park where you can visit six spots which stand for a certain topic like lifestyle, travelling and so on. If you enter one of these your interest-profile gets adjusted accordingly. After some calculations this interest profile defines which ads you get to see next on one of the billboards on the area. You can read the whole explanation on the IAN blog. Possibilities to also delete your profile and opt-out completely sound like to be added to the system soon. What might be the issues? So I personally must say that I in general dislike all billboard ideas and I guess I will not put any up on any sim I have control over (and I’d rather would like to opt-out in seeing them as I could do with an adblocker in my browser). But it seems that many (at least german) people do not think like I do, at least if you judge from the appearance of german sims such as Apfelland and so on. These are full of advertisement. And in general collecting data about residents has always been a big reason for disputes (Mark Barrett, you remember that? ;-), most recently probably about the new search engine. So we need to see how people react to it and if there’s maybe also a difference between german residents and the more international community (as we are mainly talking about german sims here). The question is also in which areas billboards in general might work. There are basically two types, one for advertising something in-world (like the EnBW campaign from IAN) and one for advertising something outside (like the Gothaer campaign), referring to a webpage. I’d actually like to see how the “click-through” and “teleport-through” rates are for this (for the first type one probably could find out easily by checking the traffic on those sims). The additional challenge with behavioral targeting might be the mix of those two types of ads and I wonder if there soon is a mechanism to track a “customer” more completely in that you know what he’s doing on the web as well as what he’s doing in virtual worlds or maybe even in Real Life. Seeing over the years more of a traditional opposition to billboards in Second Life it’s interesting to see though that this might be changing. The question nevertheless is if this is the right way to approach virtual worlds inhabitants. I merely ignore ads and if a company wants something from me I’d rather like them to come to me and engange in a real conversation instead of just dropping images on me. There might be a good way to earn money with such stuff in these early days we need to find out where this might lead. So what it turns out to be is a way to sculpt a prim by using a texture (so not really NURBS). These textures define in their RGB channels not color information but information about X,Y and Z position. They can be created by using a 3D program and using an export module. They provide one for Maya now and one for 3DS Max, Blender and ZBrush will follow. For one it might mean that creating these sculptured prims is not for everybody. I guess the main way would be to use a 3D program and export it and this would mean also that more learning will go into making these things. At least you can do it with free tools aswell, such as Blender, so no money is involved. Additionally texturing such a prim might be more difficult than as it is now as there aren’t separate faces anymore but you’d need to do real 3D mapping as you do with 3D programs. So all in all it might raise the bar for some. The advantage is of course that people using 3D programs already and having lots of existing models done with them might finally find a more or less easy way to import these models into Second Life. Of course there can only be a limited amount of detail as they recommend to use textures of the size of 64×64. Well, without having an exporter for Blender yet I am not sure of how much use this is for me as I guess it might not yield good results if I just paint something in a graphics program. 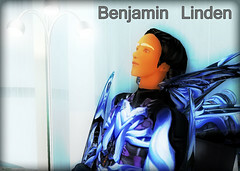 Now Benjamin Linden, the new usability expert at Linden Lab is now also holding office hours. They are held at his office every Tuesday and Thursday from 10-11am SLT (except April 13th and 17th). Topics will be interface design, usability, new features and what else might come to his mind. So come and discuss! A new Search Engine is out! As just found at John Swords Blog as well as on 3PointD, the Electric Sheep Company just published the beta version of a new search engine. You can check it out at search.sheeplabs.com where it’s showing off in a nice web2.0ish Look’n’Feel. So what’s new about this search engine you might ask? Simple, it automatically indexes objects within Second Life by using a libsecondlife based bot which teleports from sim to sim and indexes all the objects it can find. By default it indexes only objects which are set to be on sale but you can go to the SheepLabs Headquarters and change that to include all your objects or none (opt-in and opt-out). Thus there also is a virtual version of robots.txt which makes it very much web spider like. Of course there are existing search engines for objects such as SLBoutique.com (also from ESC), SLExchange.com or Second411.com. But in all of these you have to insert your objects yourself (usually by putting them into a box and updating their information on the website). So this new search is different in that it already automatically indexed more than 422,000 objects on 4612 sims (according to the Statistics page). Data it indexes are the owner and creator of the object as well as the amount of prims and the permissions. By clicking on an avatar name in the resultlist you get a list of all his/her objects and by clicking on the objectname you get teleported to that location. There is no sales function integrated as in SLB or SLX. But of course that way it’s also not that distinct from the Second Life experience as you still need to go in-world and shop there. OTOH a sales service could possibly be added later. Objects in vendors are not found which definitely is a disadvantage. Thus shopkeepers might need to rethink if they want to be findable in this engine. There is no ranking of objects (well there is but I don’t see how this could work except for naming conventions) as there are no links from objects to each other which could compute something like a Google pagerank. But the traffic on that plot might be used in some computation (although this is easy to fake as we all know). Now of course this is an early beta version and I am sure there will lots be added. Especially I’d expect a HUD interface in order to further keep the search in-world and then there would be no need to leave the environment. Basically like second411 and SLB (they have HUDs). And in general this is a great idea and I am looking forward in how it might be useful in everyday life and how big the acceptance of it will be. Definitely a cool idea and implementation! Millions of Us just opened up a new island for Intel, this time for their embedded components branch. As an example the’ve chosen a bike which gets assembled by you in Second Life piece by piece and thereby showing which Intel parts are used in such a motorbike. So if you visit their sim you can buy a HUD for L$1, click on one of the assembling workbenches and get guided through all the parts needed for such a bike. Once you’ve added all parts you become the owner of the bike and the HUD changes it’s display from the assembling view to a normal vehicle HUD and you are able to ride your bike. A track for that is available aswell. Update: Bill of MoU just told me that indeed parties and eventually races are planned and will be announced later. Find more of this later at mrtopf.tv! PS: I now also have a german blog, find it at mrtopf.de!